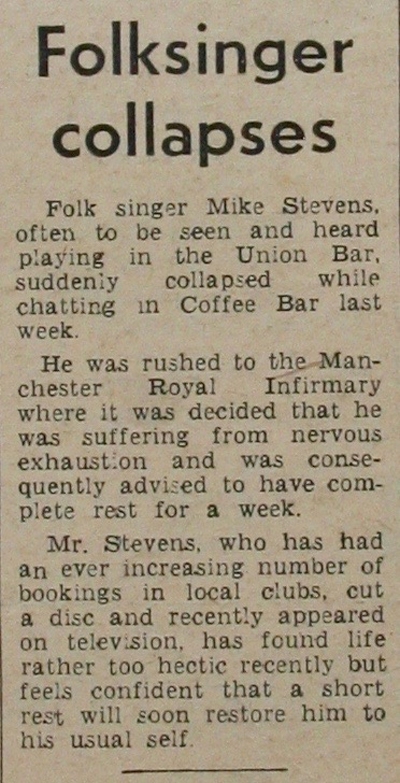 A front page column from from the Manchester Independent newspaper reporting on the collapse of popular folk singer Mike Stevens. I suspect this artist is the person who became known as Meic Stevens. According to Wikipedia, Meic Stevens (born March 13, 1942) is a Welsh singer-songwriter often referred to as "the Welsh Dylan", who has been compared with Syd Barrett. Stevens's songs have a mystical, faintly psychedelic flavour, and are mostly sung in his native Welsh language. Still largely unknown outside Wales, he was discovered by DJ Jimmy Savile, who saw him performing in a Manchester folk club in 1965. This led to Stevens recording his first single - with arranger John Paul Jones (later of Led Zeppelin) - for Decca Records that same year, though it sold badly. Today Stevens' psych-folk influence can be heard in contemporary Welsh groups such as Super Furry Animals and Gorky's Zygotic Mynci, and his song "Cwm y Pren Helyg" was recently covered by Alun Tan Lan. Several CDs of his are available from the Sain label in Caernarfon, and two volumes of his classic 1960s EPs have recently appeared on Sunbeam Records.